Peacefully at GBHS, Wiarton, Ontario on Saturday, January 4, 2014. 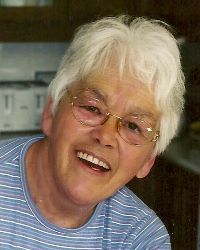 Shirley Lynne Bateson of Red Bay at the age of 71. Beloved wife of the late John Robert Bateson. Loving mother to Todd and his wife Angie of Wiarton; Carrie and her husband Scott McConnachie of Ottawa; Debbie and her husband Dave Herrington of Napanee; and Jeff Tate of British Columbia. Cherished Nana of Breanne, Kaitlyn, Autumn, Kieran, Miley and Megan. Devoted daughter of May and the late Col. James Milbrath. Much loved sister to James Milbrath (Dorothy) of Sidney B.C. ; Kenneth Milbrath (Brenda) of Victoria, BC. ; and twin to Sharon Grimes (and the late David) of Ottawa. Much loved sister-in-law of David and Sue Bateson of Etobicoke. Please join with the family for the sharing of stories and food at a Memorial Gathering to be held at the Thomas C. Whitcroft Peninsula Chapel, 272 Berford Street, Wiarton (519) 534-5341 on Saturday, January 18, 2014 from 1-4pm. Cremation has taken place. As an expression of sympathy, donations to the Heart and Stroke Foundation would be greatly appreciated. A red maple tree will be planted next to John’s at the funeral home in Sauble Beach.